become increasingly flattened (Figure 07-02b). Over time, all the material in the cloud falls into the equatorial plane, where the gas becomes rotationally supported - its motion holds it up against gravity (Figure 07-02c). In the middle of the disk, where the density was greatest, the protosun began its final condensation. By the time the Sun had initiated nuclear fusion reactions in its core, the pancake-shaped protoplanetary disk had started to form agglomerations at various distances from the center. This mechanism for disk formation is common for a variety of astronomical objects such as spiral galaxies, quasars, and black holes. Sometimes the system displays a pair of jets perpendicular to the rotational plane. It seems to be produced by charged particles moving along twisted magnetic field lines. 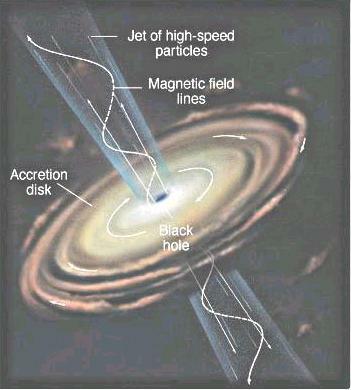 The gas and dust in the protoplanetary disk formed small bodies between 1-10 km in diameter. These bodies are known as planetesimals. Initially they formed small fragments of solar dust up to about 1 cm in diameter by the processes of cohesion (sticking together by weak electrostatic forces) and by gravitational instability. Larger bodies formed later by collisions at low speed which caused the material to stick together by gravitational attraction. Support for this view of the process of accretion comes from a region on the edge of the solar system known as the Kuiper Belt, where it is thought that the accretive 'mopping up' had failed to complete and the raw materials are still around as comets. The final stage of accretion has been described as 'runaway accretion'. Planetesimals were swept up into well defined zones around the sun close to the present orbits of the terrestrial planets. The process led eventually to a small number of large planetary bodies. Evidence for this impacting process can be seen in the early impact craters found on planetary surfaces. Two key factors determine what kind of planet a protoplanet will become: its mass and its distance from the central star. 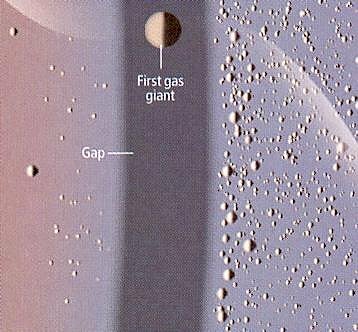 Planets of low mass cannot retain hydrogen and helium, the lightest and most abundant gases, especially if their temperature rises to the point at which the lightest molecules escape. When the planets were in their early accretive phase, the mass that agglomerated before the Sun began to shine helped determine how well the planet could retain its hydrogen and helium. The other crucial factor, the distance of the planet from the Sun, also influenced the escape of hydrogen and helium from the planet's gravity, because inner planets become hotter and so have more difficulty in retaining the lightest gases with a given amount of gravitational force. 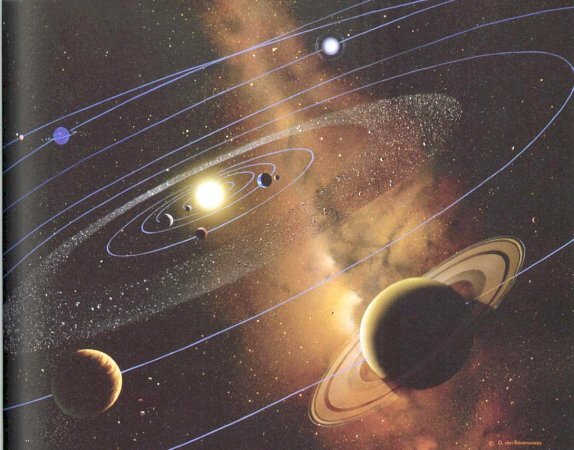 These considerations explain well the overall structure of the solar system. The four small, inner planets were unable to hold on to any free hydrogen and helium with which they may have started out. However, the four gas giants, lying much further out from the Sun and therefore having much lower temperatures, not only retained their light gases but, through their powerful gravitational pulls, continued to draw in more material after the Sun had turned on. 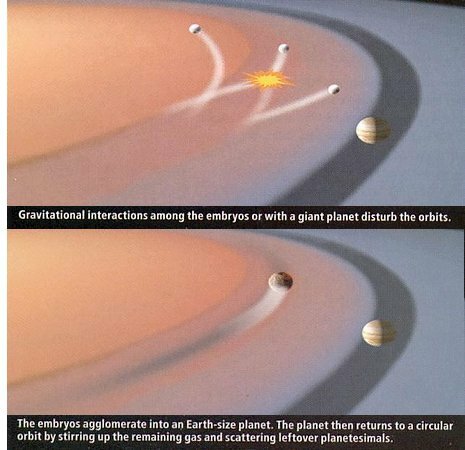 Figure 07-02d is an artist's conception of the formation of a planetary system. The first three lower inset boxes zoom in from the spiral arm of the Milky Way to a star-forming region such as Orion, and then to a newly-forming star with its gas disk. 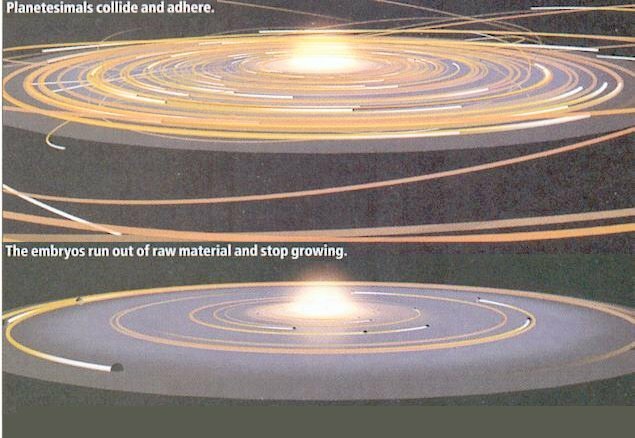 The upper picture shows that the disk has become thin and is beginning to break into rings of gas and dust. 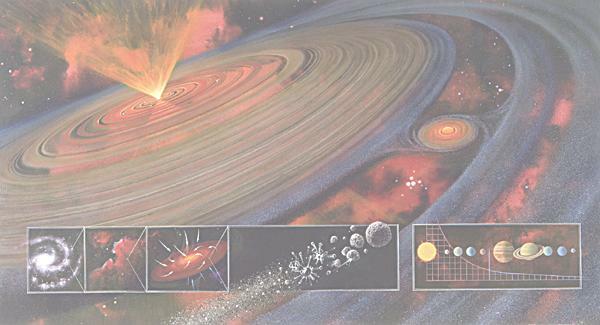 The dust rings will condense into rocky "planetesimals" that will eventually merge to become planets, as shown in the inset at the lower right. 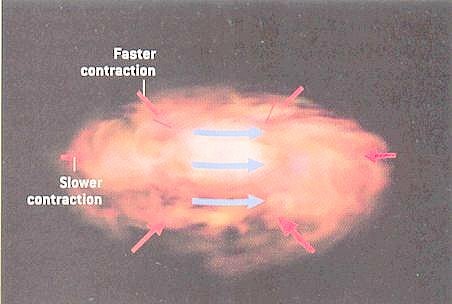 Jets of gas flow out from the newborn star in the polar directions. 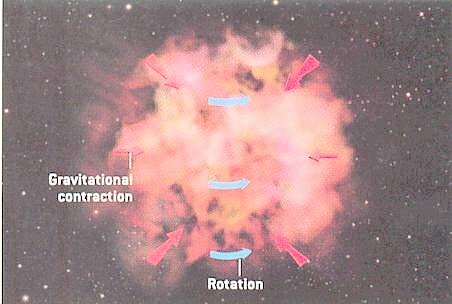 Stage 1 - Interstellar cloud of gas and dust collapses into cluster of stars, a process that takes 100,000 to a few million years. Surrounding each star is a rotating disk of leftover material. Stars between one million and 3 million years old have gas-rich disks, whereas those older than 10 million years have meager, gas-poor disk, the gas has been blown away by the newborn star. This span of time delineates the epoch of planet formation. 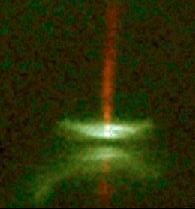 Figure 07-02e shows the view of a protostellar object called HH-30, it reveals an edge-on disk of dust encircling a newly forming star. Light from the forming star illuminates the top and bottom surfaces of the disk, making them visible, while the star itself is hidden behind the densest parts of the disk. The reddish jet emanating from the inner region of the disk is possibly directly from the star itself. 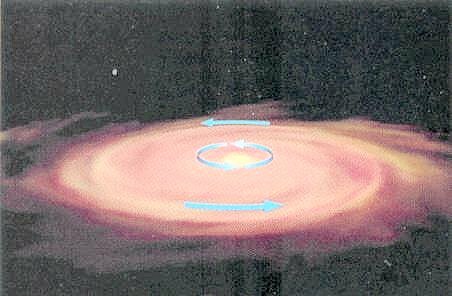 Stage 2 - In about one million years, the disk will separate into two parts divided by a "snow line" at a distance of 2 - 4 AU. It divides the planetary system into an inner, volatile-poor (lack of low boiling point substance) region filled with rocky bodies and an outer, volatile-rich region filled with icy ones and thus marks the boundary between the rocky planets and gas giants. Figure 07-02f depicts the processes leading to the production of the "snow line". 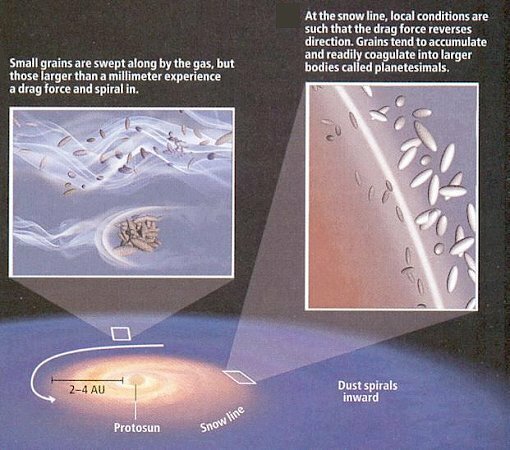 The micro-size dust grains eventually grow (by gravitational attraction and adhesion) into kilometer-size bodies called planetesimals. Stage 3 - Within one to ten million years, the planetesimals collide and adhere in runaway growth into moon- to Earth-sized bodies known as embryos. Each embryo's feeding zone is a narrow band centered on its orbit. Its growth stops once it has acquired most of the residual planetesimals in the zone. Many of the aspiring planets will be removed in the process of settling down into a stable configuration (Figure 07-02g). 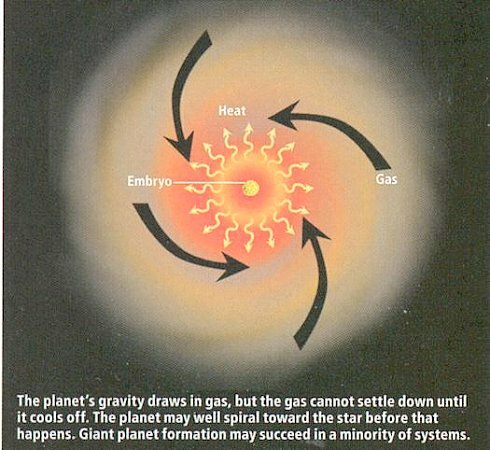 Stage 4 - The formation of gas giant such as Jupiter is critical in the history of planetary system. If such a planet forms, it shapes the rest of the system. But for that to happen, an embryo must accumulate gas faster than it spirals inward (Figure 07-02h). planet with it. 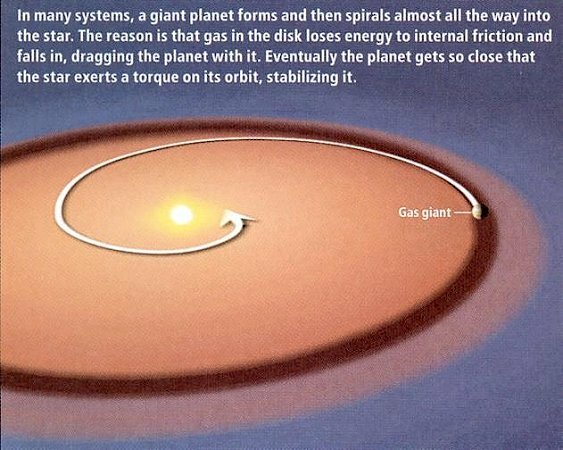 Eventually the planet get so close that the star exerts a torque on its orbit, stabilizing it (Figure 07-02i). in from the outer reaches of the planetary system. Thus, the material accumulates on the outer edge of the gap, where it can coalesce into a new gas giant. stable orbit via interaction with the remaining gas and leftover planetesimals. Stage 8 - Near the end of the planetary development from 50 to 1000 million years, a few remaining processes are still running to fine-tune the system: the disintegration of the star cluster, which may destabilize the planets' orbits gravitationally; internal instabilities that develop after the star clears out the last of its gaseous disk; and the continued scattering of leftover planetesimals by the giant planets. At the end of these mop-up operations, the planetary orbits will be adjusted to the more stable configuration (Figure 07-02l). In some systems, epic collisions of full-fledged planets can occur late in the development stage.